Boilers2Mars is a crew composed of all students an alumni from Purdue University in West Lafayette, Indiana. With backgrounds in aerospace engineering, life sciences, planetary science and agricultural engineering, several research projects are scheduled, the contents and goals of which are as follows. Further information on each research project can be found in the Preliminary Research Information forms. Research Question: Can the use of remote sensing performed by astronauts in various locations to support advanced In-Situ Resource Utilization (ISRU)? Can these properties be used to determine the best collection tools (rock hammer, trowel, spoons) to be used for each type of material? 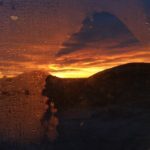 This project has the goal of identifying the richest source areas, and give information about the best techniques to collect and process the material. significantly differ from the results obtained on the International Space Station (ISS)? How has the quasi-isolated environment of the MDRS affected microbial growth? in use on the ISS for real-time microbial detection will be imitated in order to align results. In particular, see the study by Ichijo et. al cited below. Research Question: Is radio direction finding an effective means of low visibility navigation during EVAs on Mars? What are the challenges of this type of navigation and what improvements may make it better suited to a Mars mission? 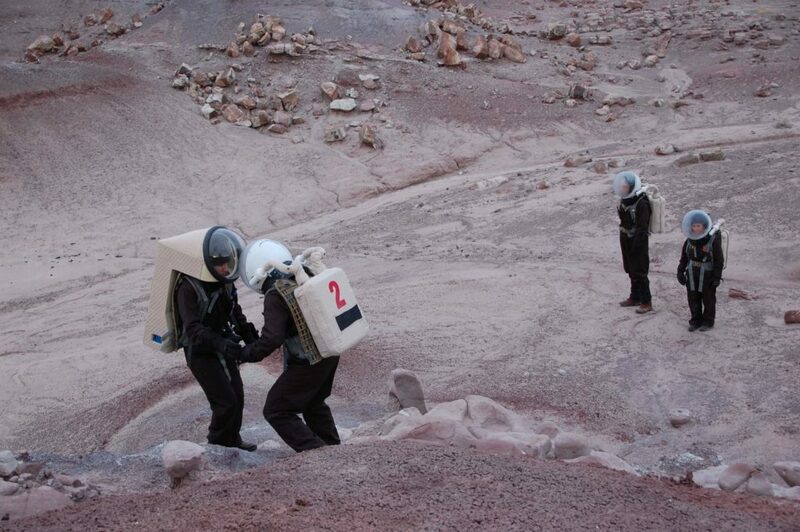 Experiment Procedure: During each EVA, the crew will obscure the upper half of their visibility to limit their field of view to only their immediate area. One person on each EVA will have an unobstructed field of view and ensure the safety of their crewmates (e.g. preventing them from wandering off a cliff). The experiment subject rides in a rover with their eyes closed. After being transported 2-3 km away from the habitat in a direction they have not been told, the crew member then uses the yagi antenna to establish a bearing on a radio beacon in the hab and being to walk back. Their GPS track will be monitored, but they will not have access to it during the experiment. Over the course of 3-5 EVAs of increasing complexity will be performed to assess the effectiveness of the navigation technique. Research Question: Yoga comprises of many postures or “asanas” that have positive effects on cardiovascular, digestive, neurological systems and so on. Yoga includes breathing exercises, small body exercises and asanas that improve physiology of the crew. Meditation, on the other hand, builds focus and helps reduce stress. The idea is to use Yoga asanas and meditation during the proposed crewed mission and study their impact on the crew’s stress levels. The crew stress would be measured through subjective questionnaire at the start of the mission and at the end of the mission. Experiment Procedure: The procedure is as follows. The crew submits two subjective surveys on Perspective Stress Analysis and Self Analysis Survey based on previous month’s experiences related to stress. The crew then performs Yoga and meditation for 30 minutes each SOL. The crew fills out the Perspective Stress Analysis and Self Analysis surveys again. The overall impact of Yoga and meditation of a Martian Crew for a 15-day analog mission is then evaluated. Research Question: How well do radish microgreens grow in different growth substrates? How well will microgreens grow when removed from the context of their native microbiome? If the microgreens are colonized by microbes from the astronauts, will there be an additional effect on plant growth? Experimental Procedure: Radish microgreens will be grown in five treatments: Potting soil, arcilite, no soil, no soil with soil bacteria innocculum, no soil with astronaut innocculum. 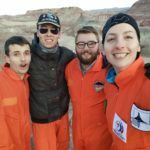 Research Question: My research will provide VR training opportunities during the MDRS mission simulation to compare to in-person pre-mission training. It will analyze the efficiency of the crew in performing the operations, including those for maintenance, repair, or emergency procedures. The research will especially explore the impact of VR training opportunities for autonomous schedules compared with detailed daily astronaut schedules. Experiment Procedure: Two training modules have been developed for Crew 186, including an EVA module, “EVA-01, Geology in the Field”, and a maintenance module, “MNT-01, ATV Maintenance: Brakes System”. The EVA-01 module developed is named “Geology in the Field,” and its purpose is to teach the crew some geology basics and how to use and care for a portable mass spectrometer. The MNT-01 module developed is named “ATV Maintenance: Brakes,” and its purpose is to familiarize the crew with the brake system and standard maintenance checks for the brake system. Prior to the mission, three participants (half the members of the crew) were selected for pre-mission training. These participants were scheduled to receive a PowerPoint version of the training modules during a designated time together, and each was allowed to ask questions, converse, and take notes based on personal preference. The other half of the crew, a further three participants, will receive in-the-field VR training immediately prior to completing a task. This crew will be allowed to choose a time at their discretion (though on a designated day), but they will do the training individually without the ability to discuss with the investigator (myself) or other participants. Each participant will be scheduled for a maintenance EVA and a geology EVA, in order to complete the tasks described by each module. During their participation in sim, their performance, familiarity, comfort, etc. will be analyzed. Surveys will be used for further data, self-reported, following the tasks’ completion. This data will hopefully answer the questions regarding the efficacy of VR training in the field and the potential of crew autonomy. Summary Title: Happy Arbitrary Orbital Maker! 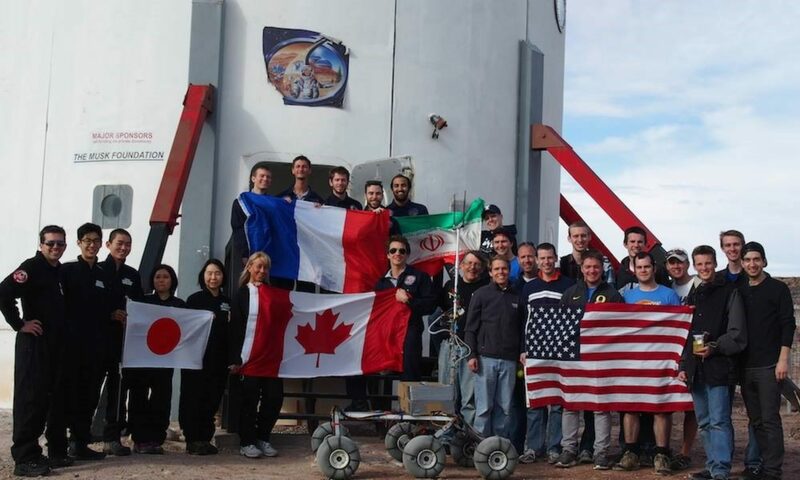 Mission Status: All crew members ready and eager to ring in the new Earth year on Mars. Sol Activity Summary: Today’s non-sim sol began with the handoff from Crew 185 to 186. We swapped staterooms, car keys, and mission patches and bid each other farewell. 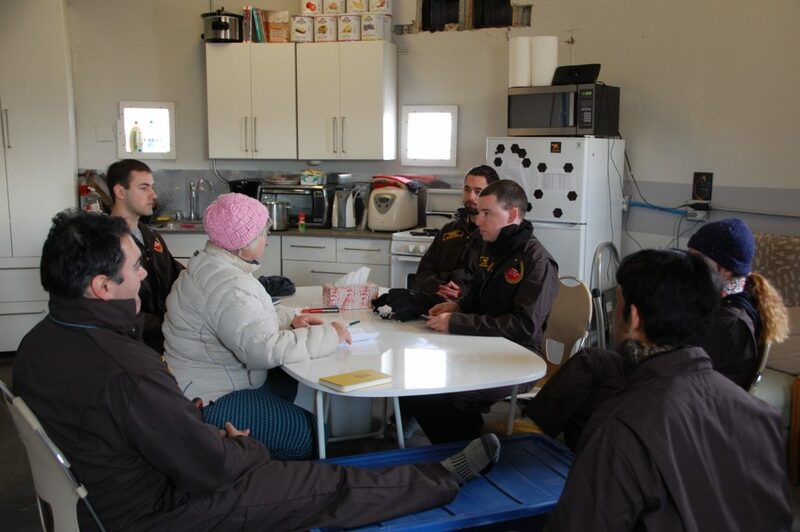 We then completed two training sessions with Shannon on hab operations and EVA activities, and took a practice non-sim EVA. We are planning to enter sim at 10AM tomorrow morning, after completing some crew portraits we were unable to complete today before sunset. Tonight, we will finish our mission summary, take one final trip into town for some last minute items, and celebrate the new year with a bonfire. All martians welcome (and their dogs)! Look Ahead Plan: Complete crew portraits at sunrise tomorrow morning, enter sim, and take first geology EVA to Greenstone Rd. Continue unpacking equipment around the hab. 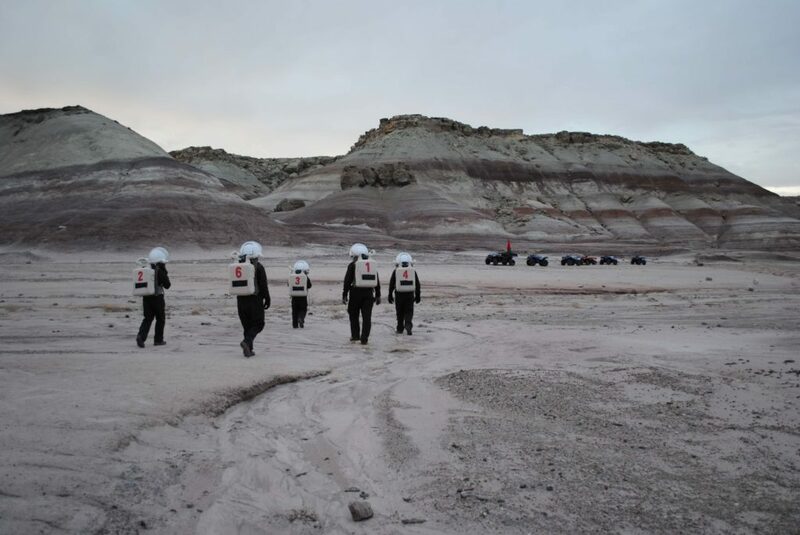 EVA: All crew members took a non-sim EVA south of the Hab to practice driving and hiking in full gear. We practiced proper hill climbing/descending technique, and breath management to minimize fogging. Support Requested: Awaiting a new template for the EVA report and EVA request. Note: We have composed a shared document with all the report templates we have received in order to speed up report composition and minimize transmission errors. One consequence of this is that it will take a few transmission to make sure the templates have been copied correctly. If there are any errors in the report format (anything as small as missing line breaks), please let us know. We update the common document to reflect the changes. General notes and comments: Some clarification is needed about the water meter, but questions are below! It’s rather difficult to guess the gasoline used by the ATVs, though this will become easier when I have enough gasoline to fill them up and keep track from there. Also, I need to become better at checking the rover charges after use, so I apologize. Curiosity was plugged in without checking the ending charge, so when I went back out, it had already been charging for a little while. Otherwise, all is good, and we learned a lot from Shannon today in an effort to prevent dilution of knowledge during hand-off! The crew had a ton of fun toying around on the ATVs today for practice, becoming more comfortable with them. Then we were also able to drive around suited up, so this was a fun experience. Pretty surreal to walk around in the suits for the first time! What a first Mars walk today! * Kitchen: The right handle of the sink isn’t working. * Water: Ops report asks for a “Water Meter” reading. Is that (A) the value I see under the black cap with the “potable” label on it, up in the loft? Or is it (B) the level of the water (Gallons) in the loft tank (which changes a lot throughout the day, especially if I refill it)? * Heat: Water heater is disconnected and Shannon said that Curtis needs to come back and fix the system, including allowing heated water to come back up to the kitchen. Also, we really need a better, stronger heating system because the current one can barely manage to bring the water above freezing, instead of the preferred ability to actually make the water feel heated. * Hab Car: Needs an oil change please, the Check Engine light is on again (among other issues). * RAM: Considering using the little back-up generator to power the RAM for special operations. Since the generator routine has been working well for now, we think the back-up should be ok in this usage. Crew Engineer with help from others will look into moving it and the wiring necessary in the coming sols. * GreenHab: Axle needed for wagon — Carrie(?) comes back on 3rd to address this. – Rearview mirrors are REALLY needed, pretty please! Absolutely impossible to see anything behind you while in spacesuits, and I consider this a safety and operational Must. I’m absolutely willing to install them, and I feel relatively cheap ones could be found quickly online (Amazon? ), if Shannon could receive packages. – We need more gasoline– very low at around 0.5 Gallons left. I will fill the ATVs up and then be able to really track our usage. * Generator: We turned the Generator back on after a couple hours in the morning when it was clear the Solar SOC was dropping rapidly. However, in the afternoon when the Solar SOC was back up to 100%, we turned the generator back off. This was not the proper decision. In the future, during cloudy days we will leave the generator on and plugged in the entire day. This is considering that we have a second battery (not known until this evening) and also a generator master guy in town said that we can trickle charge it– i.e. charge the battery and have it connected to the generator at the same time. Changes to crops: Beans nearing harvest. Cucumbers recovered from wilting. Nothing died and nothing was planted. Morning research observations: Moringa experiment watered and plants look normal. Narrative: The handoff from Crew 184 went very well yesterday. Thank you to the Green Hab Officer David for walking me through the experiments. Today I watered the crops whenever there was a break in crew training. The beans and radishes are near harvest. There are +20 tomato, +10 cucumber, and various other plants in intermediate growth stages. I’ve built a device to log temperature and humidity continuously throughout the day using an Arduino, DHT11 sensor, and an SD card shield. The device has been running all day and will continue to record through the night to determine the maximum battery life. Tomorrow I will create a complete inventory of the crops and current experiments. As well, I will prepare the East half of the Green Hab for my experiments with microgreens. Support/supplies needed: Potting soil needed. Today the crew completed the last of our training. It was a busy day that began with bidding farewell to crew 185 as they departed the habitat and headed for home. We did our best to help them pack and promptly filled the vacant hab with our own cargo. Prior to lunch we met with the station’s director to receive a full briefing that reviewed much of the procedures taught to us by crew 185 yesterday. We subsequently took a brief break, which we utilized for lunch and to finish moving into our staterooms. 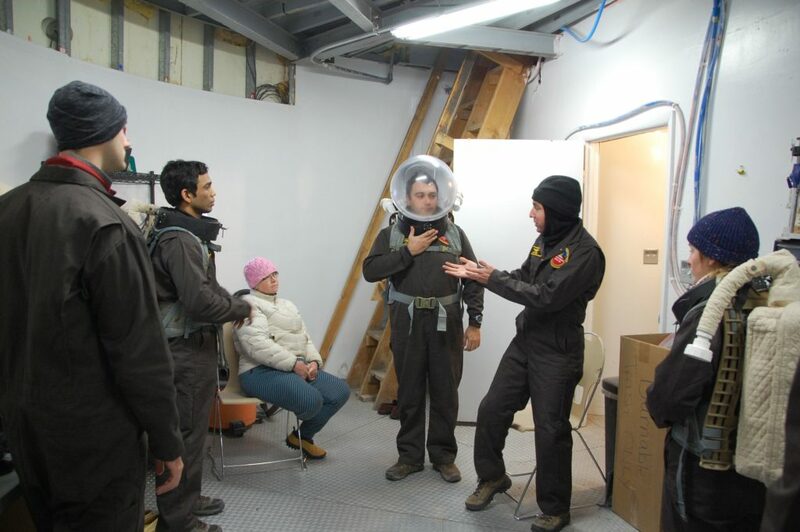 Our final training task was to learn how to don the realistically bulky space suits. Our commander, Max Fagin, led the briefing based on his experience on a prior mission. With the entire team suited up, we explored the local area on a practice EVA that allowed us to become familiar with the limited mobility afforded by the suits. Tonight we will celebrate the new year to the taste of lentil soup, oven-baked ziti, and fudge brownies – all cooked by our crew’s geologist and signature Italian chef – Cesare Guariniello. We plan to formally enter the simulation late tomorrow morning. Currently charging: Has been fully charged during the day, not charging now. HabCar used and why, where? Yes, to bring water to the next crew 186. Everything eventually comes to an end, even the greatest experiences in your life. This time, it is really the end of our Crew. Crew 185 is dead. Long life to Crew 186! This morning, we woke up on the Earth. What a pleasure to feel the light of the sun or the cold and dry wind of the desert on your skin, without a foggy helmet! 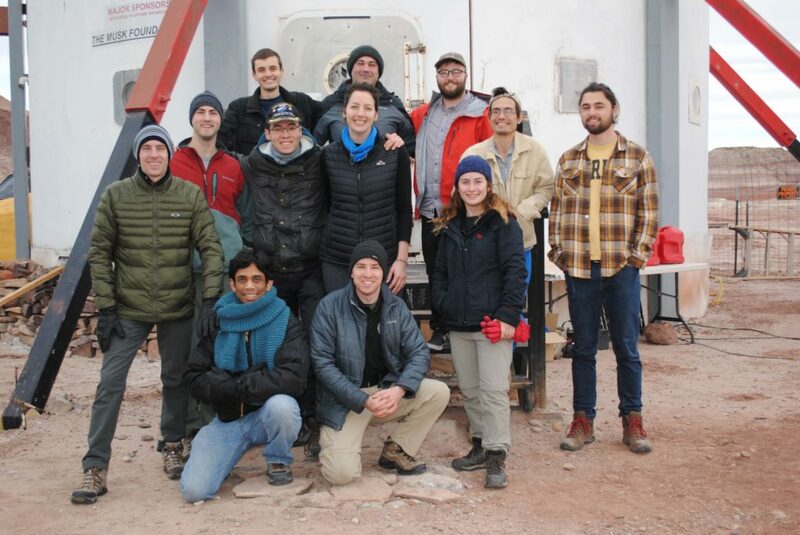 Then, we welcomed Crew 186 and we presented them the Hab, the Greenhouse, the Science Dome, the Observatory… and we explained them how the base works, how to do a report for mission support or how to optimize their water consumption in the desert. We had a nice dinner together and a very pleasant evening. I am very confident that they will be an amazing crew!